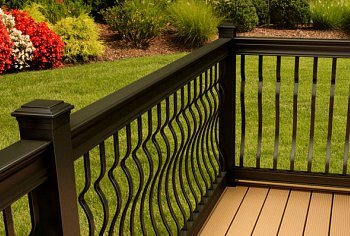 Aluminum deck railing is a great option if you're looking for a smart alternative for your deck. Its strong, beautiful, and versatile. You will find no splinters, it won't rot, and aluminum won't rust. Consider the added value of a low maintenance schedule and there are many reasons to choose aluminum. You can eliminate staining and painting, and there will be no need to apply a weather protectant every couple of years. In fact, you'll never need to do it. Ever! Aluminum deck railing is easy to install. There are different fastening systems from various manufacturers, but they all function in a similar way. Brackets hold the top and bottom rails to the posts, and the pickets (balusters) are either fastened to the rails or they fit into pre-drilled holes. 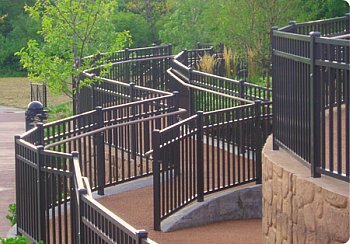 Aluminum deck railing is available in two ways - either in stock lengths or in custom lengths ready cut for your particular application. Generally the stock material will be cheaper, but there will be more labor costs since it will have to be cut on site. Cutting aluminum is not difficult, but it will add time to your installation. 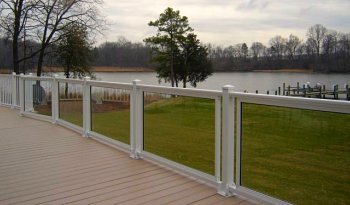 Aluminum deck posts are available in several sizes and can be attached to either the deck surface or to the fascia (the side of the deck). Posts are fastened easily and securely with screws. Aluminum deck railing is available in an array of colors. The powder coat finish looks great and is very durable. When first applied, this finish is part paint, part resin, and is applied as a powder. Then it is baked at a high temperature, causing the melted powder to fuse with the outer layer of metal. The result is a very smooth and very tough finish. Aluminum can be combined with other materials to create a variety of interesting and attractive options. Aluminum balusters are often matched with wooden posts and rails. Aluminum railing works well and looks great when combined with brick or stone posts. Cable railing can also be used with aluminum posts to create a beautiful railing and open up your view. 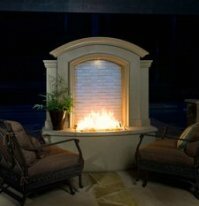 Another great option is to use glass panels inside aluminum frames. 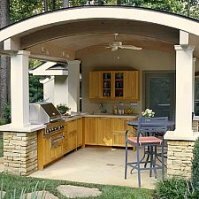 These are available in pre-cut and assembled sections made especially for your deck. The sections bolt directly to the posts giving you a clean open look. If privacy is a concern, you can use solid panels between the posts to block the view. 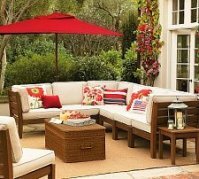 You don't have to block the entire deck unless you have a need, so consider a combination of styles if that suits your needs. I suggest Railingworks.com as a source for these and many other aluminum railing options. Aluminum balusters, or pickets, are generally either round or square. Either option is fine, although I have a personal preference for the round style. I just think it looks a little cleaner and classier. Maybe that's because you can't get that look with wood, so it's something different. Pieces of decorative scroll work can be placed between some of the balusters if you want a more distinctive appearance. The balusters are also available in decorative architectural designs. The material itself is usually flat, but is pre-formed into a series of shapes and curves in order to create a more interesting and distinguished look. These are sometimes referred to as "belly" style, since the bottom half often resembles a protruding mid section. Most aluminum balusters are available in either 36" or 42" lengths, although the 42" lengths are usually used in commercial applications. 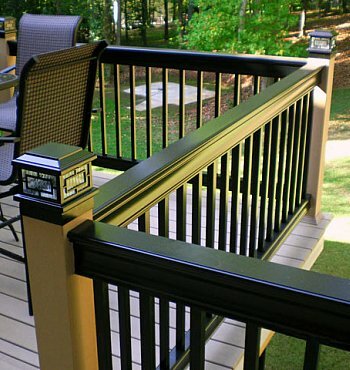 Aluminum post caps are made to match the posts and rails, and can be plain or decorative. Some of them are even lighted, either with solar power or low voltage power. Be sure to give aluminum deck railing some serious consideration for your deck or patio project. The combinations are almost endless and you'll be happy for years.